Juvenile Rheumatoid Arthritis (JRA): Does JRA Ever Go Away? Children can develop many of the same types of arthritis that adults do. Around 300,000 minors have been diagnosed with an arthritic disease. However, unlike adults with similar diagnoses, children with appropropriate treatment can live long and active lives. Like adult rheumatoid arthritis (RA), Juvenile Rheumatoid Arthritis (JRA) is caused by the body’s immune system attacking its own healthy tissue. Researchers believe that children, just like adults, have the same genetic tendencies that can be triggered to develop arthritic diseases. Research has not provided any conclusive solution to preventing arthritic diseases in children because the cause of the initiation of immune malfunction is still widely unknown. In the United States, JRA is the most common term to encompass all of the types of arthritic diseases that children can be diagnosed with, but there are several other terms that exist. Juvenile chronic arthritis and juvenile idiopathic arthritis are terms that are interchangeable with JRA. In early years, many children with JRA experience slower­ than­ normal growth, with some joints developing faster than others. This leads to legs and arms with different lengths, and may even affect a child’s overall height. In most cases, children diagnosed with JRA at a young age fall behind their peers on the normal pediatric growth curves. JRA may develop in any, or all, of the above methods. In some rare cases, patients will have joint problems throughout their body, and may experience organ damage due to high inflammation. There are several types of JRA, and each type affects the body in a unique and distinguishable fashion. JRA can begin at anytime up to 16 years of age. The disease is considered chronic if the symptoms last from 6 weeks to 3 months. Some children will have persistent symptoms for the rest of their lives, while some will only show signs of the disease for a few months. Oligoarticular (sometimes known as Pauciarticular) JRA is a type of JRA that initially only affects five or fewer smaller joints usually in the wrists or knees. About 50% of children with arthritis have this form. It has the potential to follow children into adulthood depending on the age they begin showing symptoms. If children are younger than 7, there is the possibility that, over time, the disease will go into remission. Children over 7 have a much higher chance of the disease spreading to other joints and continuing through adulthood. Polyarticular JRA can begin at any age and affects five or more joints of any size in the leg, arm, jaw or neck. Unlike adult RA, there are no blood tests that will positively identify JRA in children. While adults with RA will usually test positive for factors and antibodies associated with RA, like anti-CCP or RF, children with JRA will usually test negative for these same factors. A physical examination may also discover a swollen liver, spleen and/or lymph nodes. 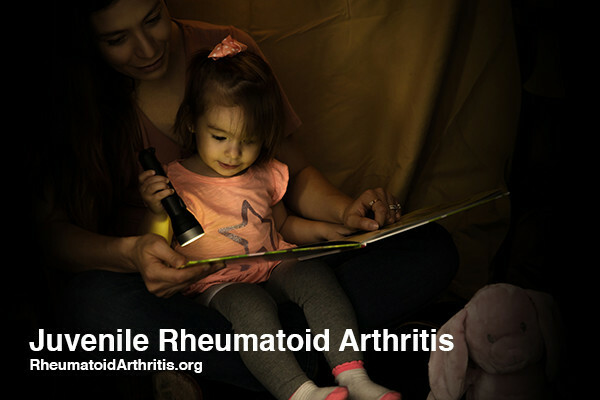 To diagnose children, rheumatologists depend on physical examinations, imaging tests and monitoring the progression of symptoms. Systemic onset JRA is the least common type of JRA, only affecting about 10 percent of individuals with arthritis. It begins with spiking fevers up to 103 degrees and a persistent red rash. Joint swelling and damage may not appear for months or years after the fevers begin, but once inflammation begins it can do irreversible damage to joints and internal organs. Anemia and elevated white blood cells can be an indicator of JRA. These are evaluated by blood tests. In some cases, symptoms of JRA can extend beyond the bones. These unfortunate extensions can include the formation of iritis, uveitis and iridocyclitis. These eye problems can arise concurrently with the disease or even after JRA has gone into remission. These diseases cause inflammation in the eyes which result in blurred vision, eye pain, eye redness and sensitivity to light. It is important to take children with JRA to get regular eye exams from the optometrist or ophthalmologist because they often will have subclinical disease (i.e. their eyes will have subtle inflammation or damage which is not yet causing symptoms severe enough to complain to you about). The most important goal in JRA treatment is preventing permanent joint damage. Treatment plans often depend on the type of JRA that a child has. In Oligoarticular JRA, where the inflammation is in fewer than 5 joints, NSAIDs and corticosteroids are usually enough manage symptoms and flare­-ups. In Polyarticular and other types of JRA where 5 or more joints are affected, DMARDs and biologic drugs are used to reduce inflammation. When a child is only feeling symptoms in one joint, steroids can be injected into the joint to target local control of the inflammation before any other systemic medications are tried. Steroids should only be used sparingly because of their undesirable side effects such as poor growth and risk of infection. For more information on treatment options, view our treatment section. Many children experience symptoms for months, or even years, and then go through a remission period, where side effects will disappear completely, only to return months later. In between these remission periods, symptoms will occasionally get much worse for a short period of time — this is called a flare­-up. Many children experience a few flare­-ups throughout remission cycles while others will go months, or even years, without side effects. With any type of RA, each case is different. JRA is no exception to this rule. Thankfully, there are ways to improve these symptoms and fight against JRA. Proper diet and low­ impact exercise programs are great ways to control inflammation. Doctors can prescribe some helpful medications that will fight against progressive joint damage. If you or your child are experiencing symptoms associated with RA or JRA, please see a doctor immediately. It is extremely important to keep life as normal as possible for children with JRA. Leading an active lifestyle with exercise and independent activities will keep muscles and joints stronger. Activity and positive reinforcement will also keep children from developing depression or other negative emotional and social problems. Support groups and summer camps are great places for children with arthritic diseases to interact with others who share their diagnoses and find a group of individuals who understand their daily difficulties. The Arthritis Foundation provides search tools for locating local groups and summer camps as well as information about annual conferences they hold. JRA is a difficult and often debilitating disease that makes it difficult for children to lead normal lives. Restoring normalcy and providing treatments that allow a child the fullest life possible is of utmost importance when dealing with this disease.